Seeing spots? Good news! You're healthy. The real test here: Look a little closer to make out hidden numbers in this timely spin on the classic Ishihara color test. Hang one in your home or office to make time checks a fun and colorful check-up. Talk about clocking in! Made in the U.K.
Comes ready-to-hang. Requires 1 AA battery, not included. Color Blind Clock has been discontinued. When it sells out, it will no longer be available. The clock is made of a sturdy glass with metal hands. It keeps great time and is a wonderful addition to our office. Love this clock. The second hand was a bit tricky to install, but it's been working fine since we hung it up. it looks great on our kitchen wall, which we painted red. I was getting tired of boring silver accessories and this was an antidote! 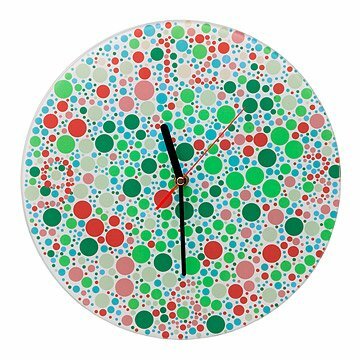 The clever Color Blind Clock features red numbers 'hidden' in green and blue dots based on the classic Ishihara color test.